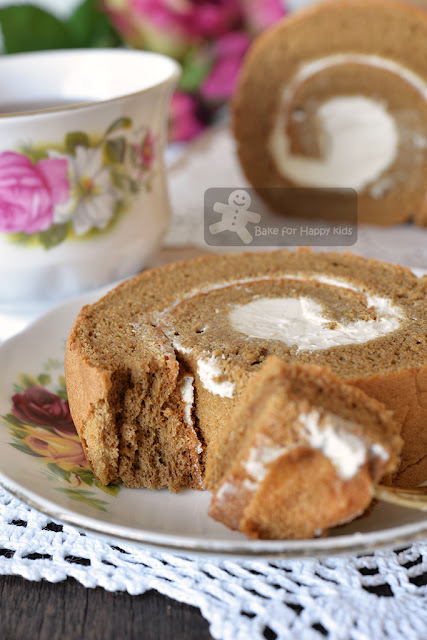 Bake for Happy Kids: Cottony Soft Coffee Chiffon Swiss Roll - HIGHLY RECOMMENDED!!! 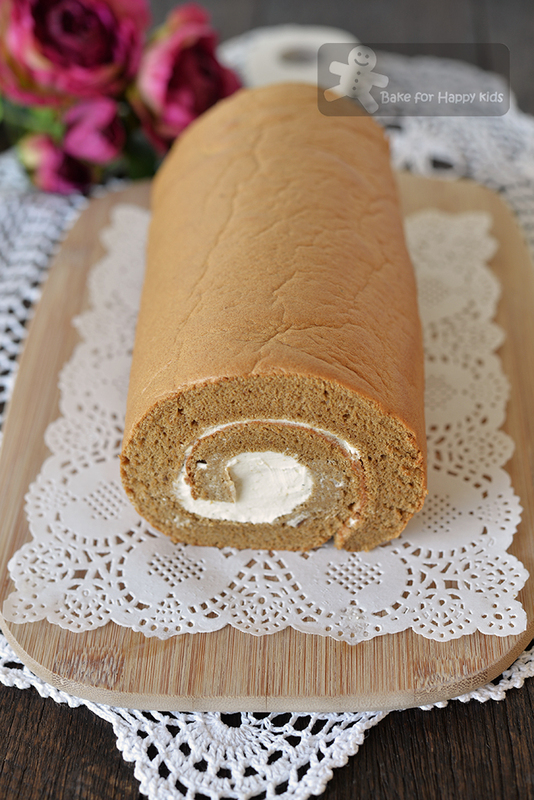 Cottony Soft Coffee Chiffon Swiss Roll - HIGHLY RECOMMENDED!!! After enjoying the Hurricane Chiffon Swiss Roll with thicker cake base at here and here, my husband and son told me that they actually prefer Swiss rolls that are BIGGER, FLUFFIER with THICKER cake base! "... but you said that you don't want too much cream in your Swiss roll! And I will need to apply more cream into the thicker cake in order to roll it properly." I had to explain this baking detail to my fussy husband and asked him if he wants a THICKER FLUFFIER Swiss roll with MORE CREAM or regular FLUFFY Swiss roll with LESS CREAM. "I want my Swiss roll to be FLUFFIER with MORE CREAM!" said my son without any hesitation and my husband had to reluctantly agree with him. When my son had his first mouthful of this Swiss roll, I can tell that he was completely sold! "Mum, can you bake more of these BIGGER FLUFFIER THICKER Swiss rolls?" Yes, I will. Will you? Do you know that the thicker Swiss roll cake base is actually more difficult to bake and handle? And you will need at least 150ml whipped cream to roll the Swiss roll into a perfect round shape. I must admit that I had been stingy with this cake as I had spread only 120ml cream on it eventually. Nevertheless and honest speaking, I reckon that 150ml cream is the most ideal minimal amount to use. If you are not confident to bake this bigger fluffier Swiss roll, I suggest that you should bake 80% of this recipe with the same baking tray (35 x 25 cm / 10 x 14 inches) for 15 mins and roll the smaller cake with 120ml cream. For me... After baking this thicker Swiss roll, I would say that most likely, I won't bake the smaller Swiss roll anymore! LOL! 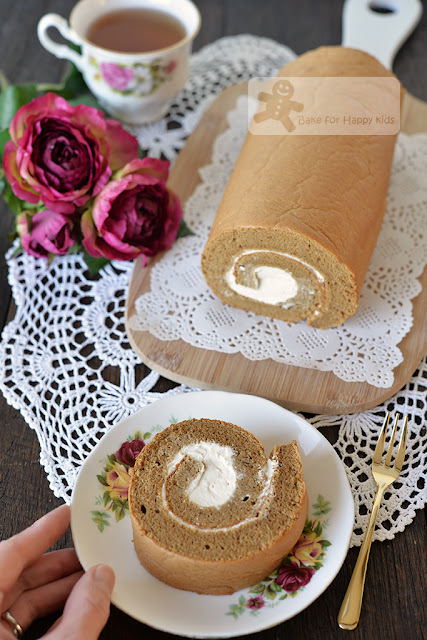 to bake this EXTRA THICK and FLUFFY Cottony Soft Coffee Chiffon Swiss Roll. See that it is EXTRA THICK and FLUFFY? It's also very very very yummy with a lovely bittersweet coffee taste and fragrance! I will bake this extra thick and fluffy cottony soft Coffee Swiss roll again. Will you? If you are interested, you might want to watch this video showing how I baked this lovely Swiss roll. I would say that this is a HIGHLY RECOMMENDED recipe. Would you? IMPORTANT: Please use the exact weight and make sure that all cake base ingredients are at room temperature. 175g egg whites - about 4-5 large but please use exact weight. 75g egg yolks - about 4-5 large but please use exact weight. * Please do not reduce this essential amount of sugar. Besides, this cake is not excessively sweetened and tastes a little bittersweet with the added coffee. ** 150ml whipping cream is the most ideal amount to fill this cake but if you like your Swiss roll to be filled with more whipped cream, you can increase the amount up to 250ml. I prefer to add NO SUGAR into the cream but if you want your cream to be lightly sweetened, you can add 1-2 tsp icing sugar into the cream before whipping it. In a large mixing bowl, combine coffee-milk mixture, egg yolks, oil and vanilla. Use a hand whisk to mix until combined. Sift cake flour, corn flour, baking powder and salt into egg yolk mixture and use a hand whisk to mix until all are well-incorporated. Set aside. Bake for 16-18 mins or until the cake is well-risen and fully cooked. Please note that under-baking the cake will cause the cake skin to be not dry enough to handle, resulting the top cake skin to stuck on your fingers or any surfaces easily. However, over-baking the cake will cause the cake too dry and not flexible enough to roll, resulting your rolled cake to crack eventually. Therefore, it is important to optimise this step based on your oven. For me, I have baked my cake for 17 mins. Place cake with its skin side down (or any side that you prefer - this side will be the outside of your rolled cake) on a clean baking paper. Use a knife to trim off about 0.5 cm from both the shorter sides of the cake. Spread thin layer of cream evenly on the cake. Roll the cake from the shorter end (that is closer to you) along the longer side to form a Swiss roll. Wrap in clean baking paper and then in cling wrap. Allow cake to firm up into its shape for about 1 hr or overnight in the fridge.